Some of our visitors have specific requirements. Visitors who are vision-impaired or hearing-impaired, have an intellectual disabilty or require physical access information, see Access. School visits should be arranged in advance with our Public Programs Department. For information and bookings, see Education. Members can access a whole range of benefits. For details, see Visiting as a member. 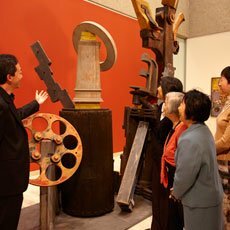 Free guided tours of the Gallery are offered in Auslan, Cantonese, Japanese and Mandarin. Maps of the Gallery with basic visit information are available online and from the ticketing and information desk, in Arabic, Chinese, French, German, Italian, Japanese, Korean and Spanish. Larger groups may wish to discuss their needs with the Gallery. For contact details, see Personal tours.